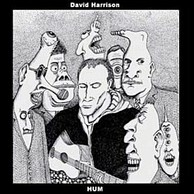 David Harrison's 'hum' is the latest album to be released by the legendary Liverpool based Probe Plus 'indie' label, run by one of Julian Cope's old mates Geoff Davies (bands on this label include the excellent Half Man Half Biscuit). Harrison appears to be selling himself as a singer/songwriter (Nick Drake/Roy Harper style) but though his album captures the acoustic mood of these artists on some songs (like 'Beautiful Miss America' and 'Megan'), tracks such as the swirly opener 'Luminous Circles' and the pounding 'She Loves the Sun' give way to more lighter psychedelic influences, the former bringing to mind (dare I say it) something off the Teardrop's Wilder album, while the later would fit comfortably on one of those excellent late 60's Garage compilations (you know the ones - filled with great music by bands you'v never heard of!). Indeed, Harrison is just like those mysterious bands, it's hard to find information on him, but the music is intriguing. For example, on various websites he describes his music as the result of tapping into some kind of universal 'hum' left over from the big bang, and this (according to him) is the secret to obtaining music! This theory seems to be displayed on the closing track 'hum' which resonates radio noise as sampled voices are heard discussing the 'sound' of the sun in the background! The album then ends were it begins; with the hum which leads into the opening track - making the CD a kind of bizarre concept album. The songs presented here do work well though, with the funky 'Fallen Soldier' throwing various sounds at the listener, including haunting sitar and a meaty 70's wah wah riff. This song flows out of the oriental sounding 'Maganda Khar' which is a feast of acoustic guitar. Other highlights include the laid back 'Lost in The Ocean' and 'Herbal Woman', the later featuring an excellent harmonica riff which pierces through the acoustic guitar. In all its a nice album, and whoever Harrison is, I hope he continues to tap into the hum!